The LDC1000EVM (Evaluation Module) demonstrates the use of inductive sensing technology to sense and measure the presence, position or composition of a conductive target object. The module includes an example of a PCB sensor coil. An MSP430 microcontroller is used to interface the LDC to a host computer. This module is designed to provide the user with maximum flexibility for system prototyping. It is perforated at two locations: one, between the PCB sensor coil (LC tank) and the LDC1000 IC, and another, between the LDC1000 IC and the MSP430 interface. The first perforation gives the user the option to snap off the PCB coil from the module and experiment with custom sensor coils. 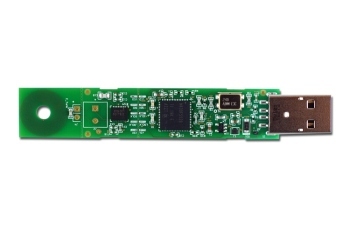 The second perforation allows the user to connect the LDC1000+Sensor to a different microcontroller system or use multiple such sensors in one system. An accompanying GUI allows for maximum flexibility and experimentation but the EVM also indicates basic conductor detection with an on-board LED.